So here we are with the first installment in the Creepy Freaks Halloween Countdown (2007 edition)! I'm not quite ready yet to kick them off on a daily basis, but hopefully this will help to get the steamroller going. I'm planning to add a link directly to the countdown to the sidebar of the content pages, but in the meantime you can access them from the blog since they're posted there as well. As I suggested previously, for each installment, I'll be selecting one box from my towering stack o' booster packs and commenting on the two Creepy Freaks inside. Those boxes are unopened -- or at least were opened and reclosed so long ago that the contents will be a surprise to me as well -- but you'll note that the four Creepy Freaks pictured above come not from the booster packs but from the initial starter set. I've decided to start with these because, in addition to the fact that I've never really given these characters their moment in the spotlight (outside of their appearances in the cartoon), quite a few of the 56 Creepy Freaks are repaints. Reviewing the eight starter pack inclusions first (there are two different starter packs) will at least give us a reference when we encounter the sixth repaint of Frosty the Snotman. That said -- and I'll write more about the details of the countdown as I think of and/or implement them -- LET THE COUNTDOWN BEGIN! Spotlighted today: Lucas and Swirly. 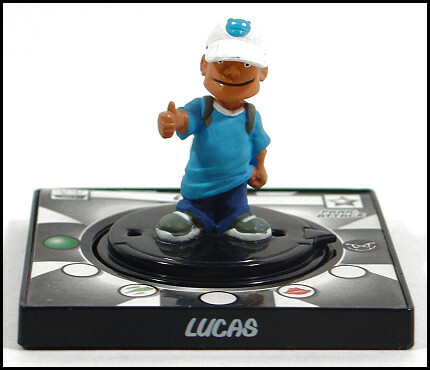 So here we have Lucas, one of the two team leaders available in the Creepy Freaks starter packs. He's more or less the Creepy Freaks version of Ash from Pokémon (he even shares the same basic outfit), only a whole lot less interesting because he doesn't have the benefit of ten seasons of cartoon episodes to flesh out his character. He's also a rather unfortunate start to the countdown, as Lucas isn't particularly creepy or freaky at all -- he's just your standard annoying snot-nosed kid brother who commands living skeletons and giant talking cartons of rancid milk in his spare time. Then again, any kid that willingly hangs out with snot monsters in a nightmare world rife with political unrest and slavery and forced gladiatorial matches and eyeball trees is probably creepier and freakier than simple appearances could ever convey. Next up, there's Swirly -- the foremost of several so-called "toilet-head" monsters in the Creepy Freaks lineup. Old fans of Ghostbusters may notice a certain resemblance to Fearsome Flush here, but Swirly improves upon the concept of a demonic toilet thing by incorporating even more toilet and bathroom-related items into his appearance. His right and left arms are respectively composed of a toilet brush and a plunger. Whereas Fearsome Flush had a thick red cow-like tongue protruding from the bowl, Fearsome Flush uses toilet paper to taste his victims. I'm not sure I'd call any of this creepy or freaky, though. I like the design, but I'd run screaming in terror if I ever encountered Swirly in a public restroom. He's even more terrifying when you consider that, in the Creepy Freaks cartoon, Swirly actually flushed an opponent down his drain, thereby devouring him whole. Judging from the excess water gushing from the bowl and the tank, Swirly is incredibly backed up with the decomposing corpses of his enemies. Okay, that was technically two paragraphs about Swirly, but whatever. 😛 See you in the next installment of the Creepy Freaks Halloween Countdown, where we'll be spotlighting Headley and Spitty Cat!